Brilliant and devout, William Porcher DuBose (1836-1918) considered himself a man of thought rather than of action. During the Civil War, he discovered that he was both, distinguishing himself as an able and courageous Confederate officer in the Holcombe Legion and later as a dedicated chaplain in Kershaw's Brigade. 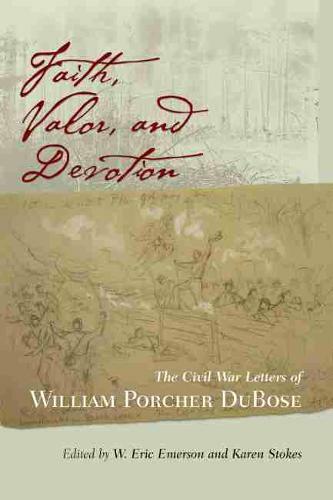 Published for the first time, these previously unknown letters of DuBose chronicle his Civil War actions with these two celebrated South Carolina units and make an important contribution to the literature and history of the war. They also advance our understanding of DuBose's burgeoning religious ideals as a Civil War combatant who would later become one of the foremost theologians of the Episcopal Church and a distinguished professor at the University of the South. A native of Winnsboro, South Carolina, DuBose was studying to enter the Episcopal priesthood when the war began. After struggling with the question of secular and spiritual obligations, he decided to join in the defense of the Confederacy and began a long and varied career as a soldier. After service in the lowcountry during the first year of the war, he was thrust into the thick of combat in Virginia, where he was wounded twice and taken as a prisoner of war. After being exchanged and returned to duty in 1862, DuBose was wounded again at the battle of Kinston in North Carolina, and a year later influential friends arranged for his appointment as chaplain in Kershaw's Brigade. He continued to share in the hazards of combat with the men to whom he ministered as they fought in the battles of Spotsylvania, Cold Harbor, Petersburg, and Cedar Creek in 1864. Adroitly edited by W. Eric Emerson and Karen Stokes, the more than 150 letters collected here prove DuBose to be a man of uncompromising duty to his faith, fellows, and the Confederate cause. He references his interactions with prominent figures of the day, including General Nathan ""Shanks"" Evans, John L. Girardeau, John Johnson, Colonel Peter F. Stevens, General Joseph B. Kershaw, Louisa Cheves McCord, and General John Bratton. Also included here are DuBose's wartime courtship letters to his fiancee and later wife, Anne Peronneau DuBose. Collectively these extraordinary documents illustrate the workings of a mind and heart devoted to his religion and dedicated to service in the Confederate ranks.